Kashmir’s oldest church comes to life with wedding bells after 30 years. 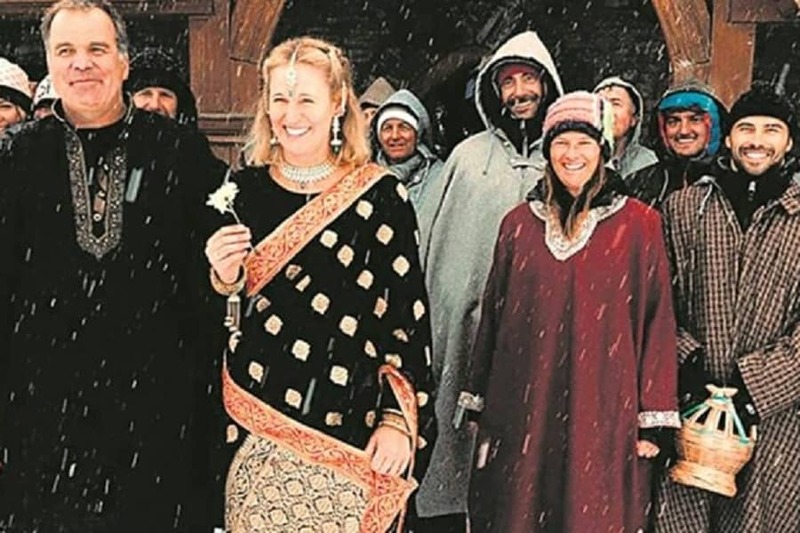 Kashmir’s oldest Protestant Church in Gulmarg ski resort came to life this Thursday with the ringing of the wedding bells as an Australian couple tied the knot there. Tim Robertson and Kate Hamilton had come all the way from Australia to get married at St. Mary’s Church in Gulmarg. The only attendance at this church for the last 15 years has been on Christmas when revellers come to Gulmarg around the New Year Eve. Both snowboarding enthusiasts, Tim told reporters Kate insisted that the marriage should be held in snowbound mountains. “No place better than Gulmarg to have a white wedding in the mountains”, the groom said. The priest at St Mary’s Church, Reverend Vinu Kaul, had received the message six months back about the couple’s plan to get married in Gulmarg. He told reporters that he believes the wedding would definitely send a positive message about Kashmir to the rest of the world. On their wedding day, Kate wore a traditional embroidered Kashmiri over garment, the ‘Pheran’ as Tim dressed like a typical Kashmiri groom. “She also tried a typical Indian saree”, Tim said. Former chief minister Omar Abdullah greeted the newly wed as he posted on his twitter page: “30 years since the last one, Gulmarg’ s historic church plays host to another wedding. Congratulations to Kate & Tim. Here’s wishing you both a life time of happiness”. In another of his posts, Omar posted pictures of the couple taken at Hotel Highlands Park in Gulmarg where the couple stayed. “More from Kate & Tim’s Gulmarg wedding. A destination wedding with a difference. Nice to see some of the wedding party on skis”, Omar said.